Chakra, from the root cak ("to move") means wheel and therefore this is the Wheel Posture. This asana is so named because the body takes the shape of a circle - or a semi-circle. The asana is very similar to the gymnastic back-bend. The pose is the same, except while doing a back bend, the person is standing and keeps bending further back till his palms rest on the floor while in the Chakrasana, the person is lying down, and slowly lifts his body up.The chakra-asana is also known as the urdhva-dhanurasana. Urdhva means raised, elevated or upright and dhanur means bow. 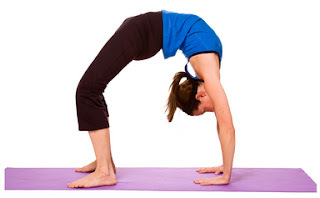 Both "wheel posture" and "raised bow posture" describe the appearance of this asana. While exhaling bend the knees and bring the feet as close to the buttocks as possible with the soles of the feet flat on the floor. While inhaling slowly, begin to raise the head, back and buttocks off the floor while arching the spine. Continue to press downward on the hands and feet while raising the hips and stomach as high as possible. Hold for the duration of the held inhaled breath. When you can't hold the breath comfortable any longer, slowly exhale and return the back to the floor, slide the legs out straight returning to the shava-asana. The chakra-asana is more challenging than most other yoga postures. Don't be discouraged if your unable to accomplish it right away. Even attempting this posture without successful completion holds great benefits. First and foremost is the strength and suppleness it restores to the spine. It strengthens the arms, shoulders and upper back as well and stimulates the cardiovascular system. The chakra-asana has an overall tonic effect for the entire body. As the natural suppleness of the spine is restored after a period of practice you can begin to perfect the form of this asana and thus experience greater benefits. First be certain that the arms are as straight as possible with very little to no bend in the elbows. When you can hold this comfortably, begin breathing through the nostrils while holding the posture and attempt to get a greater arch in the spine by bringing your hands closer to your feet and/or bringing your feet closer to your hands. Finally, you can extend the duration of the chakra-asana by doing several repetitions in sequence without resting in-between. As you return from the posture keep the hands behind the shoulders and the soles of the feet flat on the floor and as soon as the back returns to floor immediately raise it and enter the full posture again. The chakra-asana is either held for the duration of the inhaled breath or between one and three minutes while breathing gently through the nostrils. Although this variation is much easier to perform than the full chakra-asana, it shares several of its benefits. In particular it will help to stretch the spine and relieve tightness in the upper back and shoulder area. To get the full benefit of the bridge variation continual effort should be applied to raising the back upward and creating the greatest possible arch with the spine. While holding the bridge breath slowly through the nostrils. If there is no discomfort felt in the spine or shoulders then one should advance to the full variation of the chakra-asana as described above. Both variations strengthen the back and promote flexibility of the spine. Tightness in the back and spine results from poor posture, stress, a sedentary lifestyle and/or emotional disturbances. You should begin to feel the tightness being released after just a few repetitions. This pose has many benefits for the body. One of them is obviously that you get more flexible through this unusual turn of your body. It also stretches the whole body in a way that it is not stretched normally. This aides the digestive system and bowel movement. Your back also benefits from the turn in the other direction and tension caused by making a hunchback or sitting in one position for a long time is reduced. Energetically this pose stimulates the Manipoor Chakra, the solar plexus chakra on your navel. This is your action chakra, the one that distributes energy to your whole body. The energy of this chakra makes you feel active and alive! Maybe this is why children just love this pose - seeing the world upside down is also always great! And last but not least this pose also strengthens your arms as they need to hold your weight. It gets easier and easier the more often you practice the wheel. Just do it and enjoy the feeling of being upside down!